The image above is a view from the north looking south over the entrance into Cohassett Cove. The five-foot-deep dredged channel is clearly visible in the lower right-hand portion of the image, as is the stone jetty that protects the harbor from excessive swell. Bassing Beach is off to the left (east) and Bryant Point is off to the right (west). 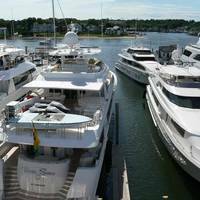 There are five marinas in Cohasset, but oddly enough, only one of them, Mill River Marine Railways, accepts transient guests. 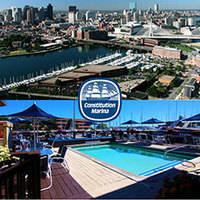 The other facilities administer some moorings that transient guests can use, but availability is not guaranteed. If you need repairs, Mill River Marine railways also has a lift for haul-outs. There is apparently no fuel available in Cohasset Cove. Cohasset Harbor is reached via an approach from the north through either Eastern Channel, Western Channel or The Gangway. 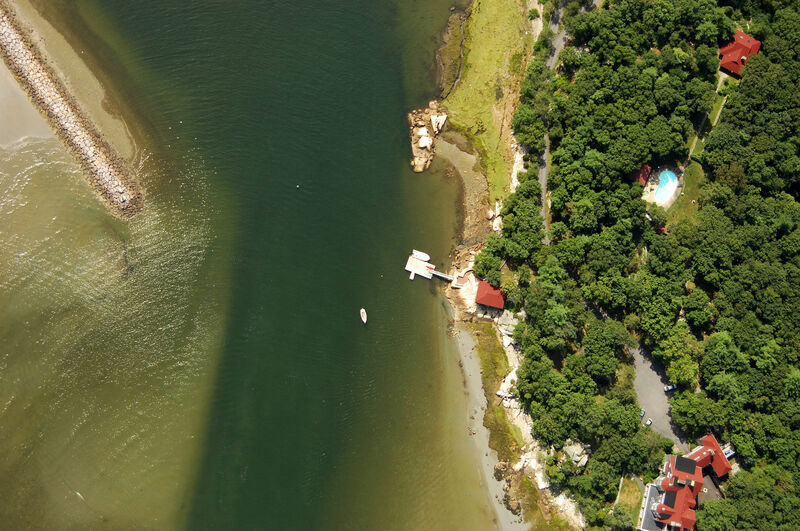 The piece of water to the north of Cohasset Harbor and Cohasset Cove is littered with named and unnamed rock outcroppings and islands. The aforementioned channels and passage are the primary means of negotiating your way through them. 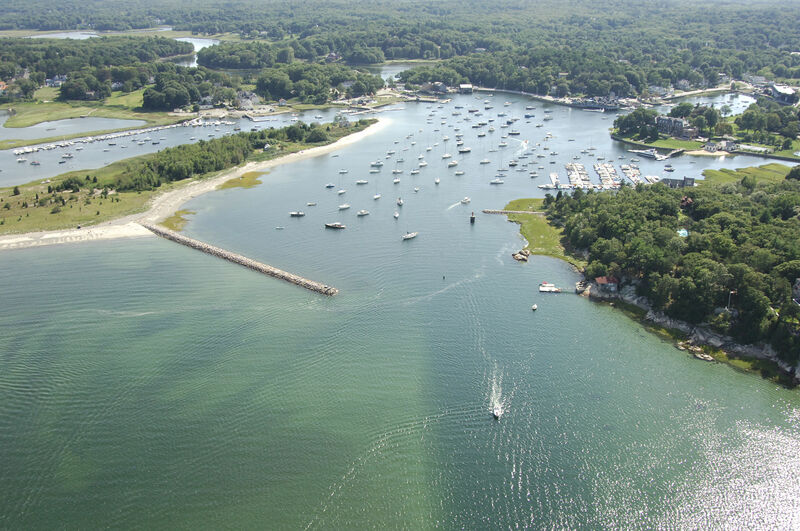 No need to worry - following the proper passages is easy and the channels are of decent depths until you reach Cohasset Harbor, where depths shallow to five to seven feet. After you have passed between green can buoy 3 and red nun buoy 4, head toward the south-southeast and find green daybeacon 5, and then red nun 6W farther on. Once you have cleared red nun buoy 6W (give it plenty of room), head south through Cohasset harbor to intercept flashing red 8, which marks the beginning of the dredged five- to seven-foot-deep cut into Cohasset Cove. This mark is followed by flashing red 9, green can buoy 11, flashing red 12, green can buoy 13, and finally flashing red 14. Depths in the cove are around five feet, but are around three feet in the small sliver of water behind Bassing Beach (upper left-hand corner of the image above). The Eastern Channel is marked by green can buoy 1E and red nun buoy 2 just east of East Shag Rock. 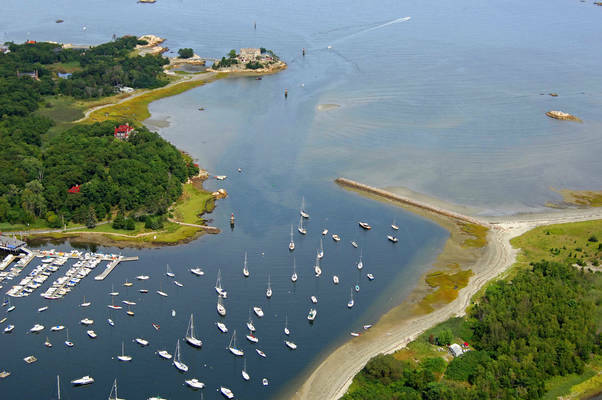 Once you have passed between these two marks, head west on an approximate course of 267 magnetic for .6 mile run until you sight green can 5 where you will set an approximate course of 241 degrees magnetic for .7 mile to pick up flashing red 8- the beginning of the dredged cut into Cohasset Cove. Flashing red 8 is followed by flashing red 9, green can buoy 11, flashing red 12, green can buoy 13, and finally flashing red 14. Depths in the cove are around five feet, but are around three feet in the small sliver of water behind Bassing Beach (upper left-hand corner of the image above). No reviews yet! 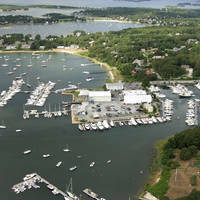 Be the first to write a review of Cohasset Cove Inlet.